Blockchain applications use technology to replace the functions traditionally performed by institutions, such as verifying identities, making sure accounts are funded before transferring value and attesting to the authenticity of an asset, giving blockchain the potential to make business processes more trustworthy, efficient and secure. “Our vision is to make the Walton College a premier academic leader in advocating for and educating on blockchains,” said Mary C. Lacity, the new director of the Blockchain Center of Excellence and holder of the Walton College Professorship in Information Systems. Lacity joined the Walton College faculty this summer from the University of Missouri-St. Louis, where she was Curators’ Distinguished Professor and International Business Fellow. 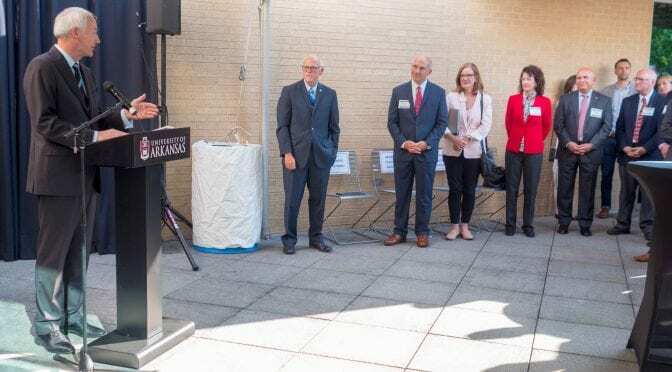 The University of Arkansas Board of Trustees and the Arkansas Department of Higher Education officially approved the center in May. U of A Chancellor Joe Steinmetz welcomed formation of the new center. The center will be a place that the university, government and industry can work together to reap the benefits of this emerging technology to benefit all of Arkansas with business development and the creation of new jobs. “The Blockchain Center of Excellence will work in close collaboration with major Arkansas-based companies that will help us set the agenda for blockchain research and integration into businesses and the creation of new businesses,” said Rajiv Sabherwal, chair of the Department of Information Systems and the Edwin & Karlee Bradberry Chair in Information Systems. The center will benefit information systems students, as well as others across the Walton College and the University of Arkansas, as they work with the latest developments in the technology and learn and create new applications for startups and established businesses. “We could not have created these opportunities for our students without the hard work of key information system faculty and the collaboration with university partners, support from the Walton College and the contributions of those in industry and state government,” said Paul Cronan, information systems professor, the M.D. Matthews Endowed Chair and founding director of the Blockchain Center of Excellence. The most value in blockchain lies in its yet-to-be-developed potential, which opens doors to a wide range of research and business applications. However, blockchain, as it stands, is not a cure-all for contract, ledger, supply chain, security and other challenges facing business in an increasingly digital and connected world. More research is needed on blockchain’s impact and implementation before it becomes a mainstream tool for business. Lacity, who also is the author of A Manager’s Guide to Blockchain for Business, foresees that the Center of Excellence will serve as a platform-agnostic, open and inclusive resource for the state of Arkansas and beyond.